← What Can You Do to Reduce Your Risk for Alzheimer’s? Your senior loved one will need water every meal time as this can help them to swallow better. Ensure that water is very accessible for your loved one. When your senior family member has difficulty in eating, chewing, or swallowing their food, help them prepare easy-to-swallow versions. Cut the food in smaller and thinner slices or mix them in with soup, broth, or smoothie. A personal care provider can also assist you or your loved one during checkups. These appointments are important for you to know if your senior family member has medical issues that affect their appetite so that these can be intervened the sooner the better. Your senior loved one will also have food preferences. Ensure that you ask them what they want to eat so you can prepare exactly what they want. This way, they can be interested to eat more because this is what they want. Whether eating indoors or outdoors, eating with friends or family members can be very enticing for your senior loved one’s appetite. To accompany them when you’re not around for a day, our adult day care in Madison County, AL can help them have quality companions for your aging loved ones. When it comes to the eating habits of your senior loved one, it’s very important for you to identify proactive ways to really encourage them to eat. We hope that the above-mentioned tips can help. 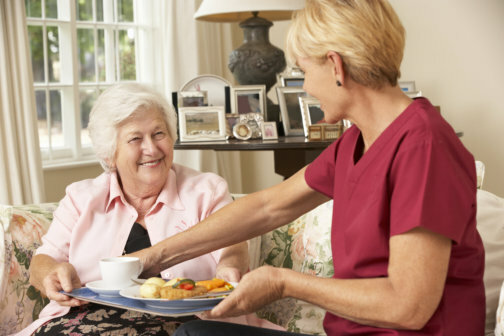 At Brooks Home Health Care, you can partner with us in providing the quality care for your loved one. Does this post inspire you? Tap SHARE! This entry was posted in Senior Care and tagged Checkups, Easy-to-swallow Meals, Eating Habits, Quality Companions. Bookmark the permalink.